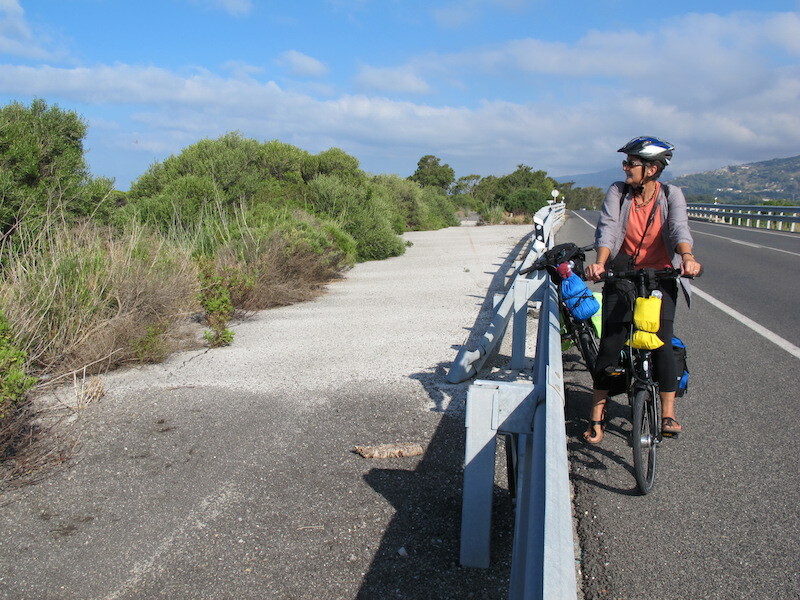 The trip from Seville to Tarifa was not arduous as all we had to do was get ourselves and our bikes aboard the bus and settle down for the three-hour journey. 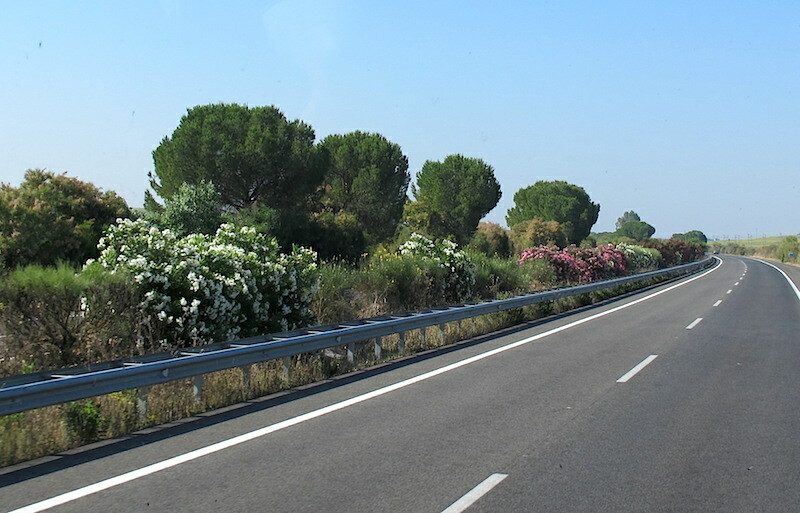 The road between Seville and Tarifa. The flowering shrubs in this photograph are oleanders. Oleander (Nerium oleander) grows in abundance throughout the southern parts of Europe and the Middle East and because it is so widespread no precise region has been identified as a place of its origin. Oleander is the most poisonous commonly grown garden plant in the world. In Australia road authorities plant it along roadside verges and strangely enough it has been planted in school playgrounds. All parts of the plant are toxic to humans and animals so it got me to thinking about the use of such a plant. Following further research I realise that asking such a question was pointless as knowing the adaptability of nature I should have known some critter would make use of the plant. 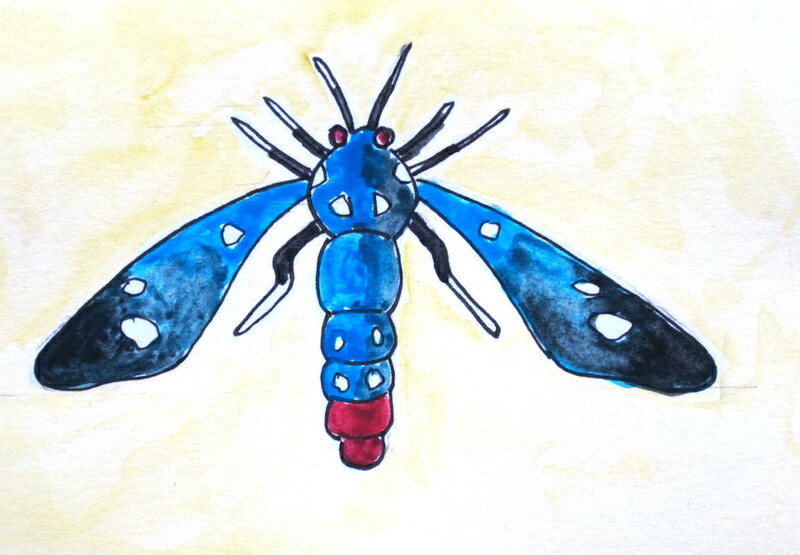 There are two insects, the polka-dot wasp moth and the common crow butterfly. Now I can’t say I am acquainted with these two species but knowing about them means that in the future I will start looking closely at oleanders. I mentioned to Bev that the Sydney Museum reported that the common crow butterfly is often seen on oleanders in Sydney gardens and she said she can remember the silver chrysalis. It’s obvious I need to raise my awareness about these two hardy creatures and to begin with I have done a drawing of each of them. Common crow butterfly. Wingspan 8 to 9cm. 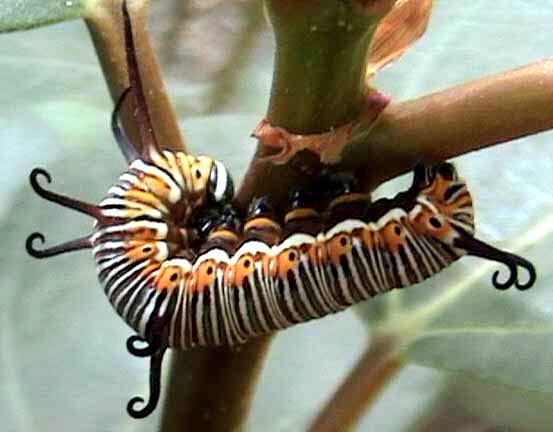 Caterpillar of the common crow butterfly. Image credit: Photo by Viren Vaz via Wikipedia. 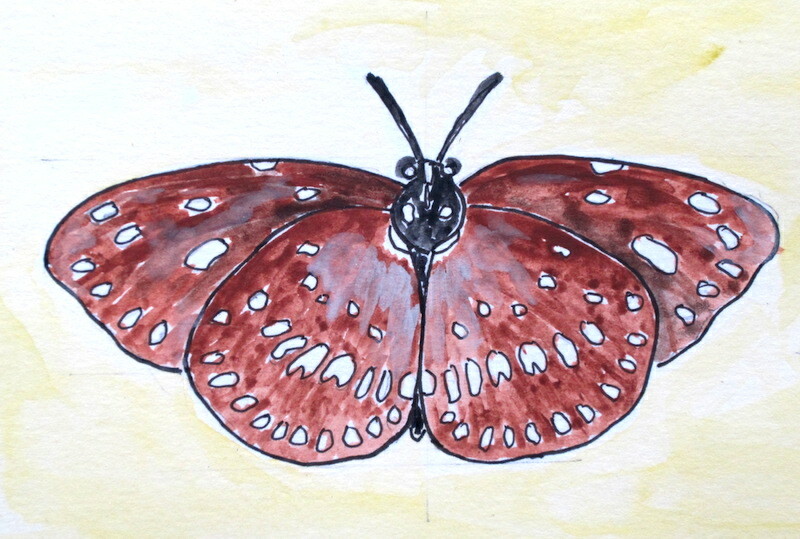 The larvae of the common crow butterfly has the ability to retain or modify the plant toxins therefore making them unpalatable to would-be predators. It never ceases to amaze me how resourceful nature can be. The caterpillars of the polka-dot wasp moth only eat the pulp surrounding the leaf veins. 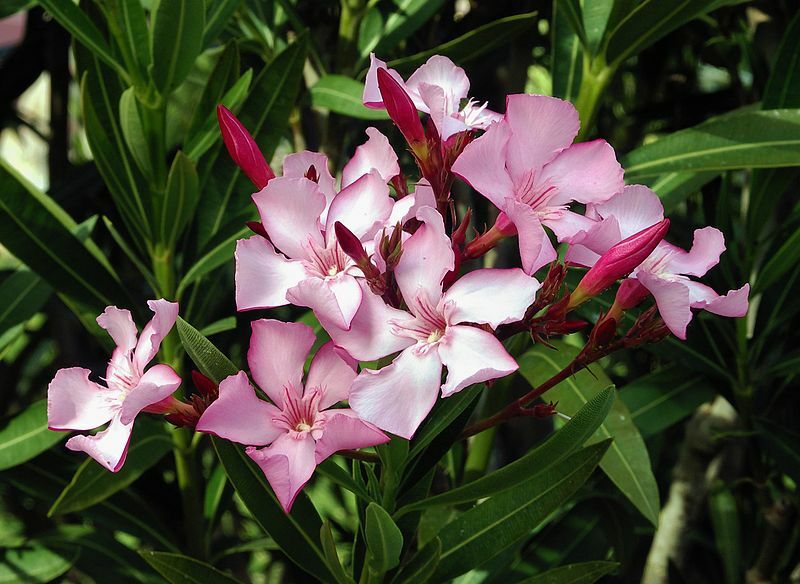 Before leaving the oleander topic there have been few reports of human deaths after the ingestion of the plant however this doesn’t mean one should start making oleander tea. There have been cases where campers burning dead oleander sticks have been seriously affected by inhaling smoke from the fire. In Australia there are many shrubs and trees one should not burn in a campfire for fear of being poisoned. Some early explorers when venturing into unknown lands took along pigs to test the suitability of plants for eating. The pigs were in effect being used as guinea pigs! The reason they were used was because they are closely related to humans on the biological chain and therefore what affected the pig was probably not suitable for human consumption. Of course if the early explorers had sought the advice of the indigenous folk they would have soon been set straight. Some years ago Bev and I were fortunate to ‘go bush’ with a group of desert Aboriginal people and they taught me how to cook a kangaroo properly. Once cooked the kangaroo entrails were extracted and the partly digested plant matter was squeezed out and eaten. My instructors said eating the plant matter ingested by kangaroos is not poisonous and the green matter contains lots of vitamins and nutrients, a must for survival. Unfortunately I do not have images of the kangaroo cooking and eating process on my laptop so I will edit this post and include the photographs when I get back to Australia. 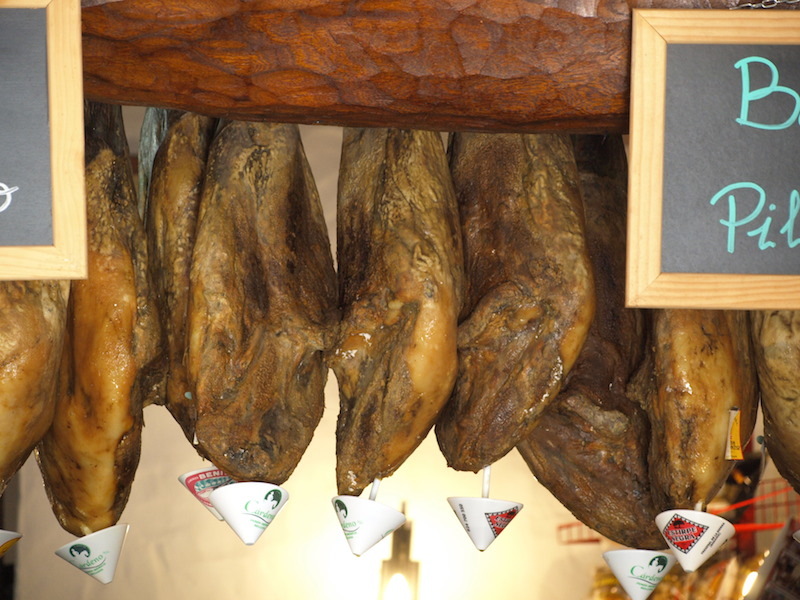 Halfway between Seville and Tarifa today we had a comfort stop which I must admit doesn’t sound all that exciting but what was of interest was the legs of ham hanging over the bar. 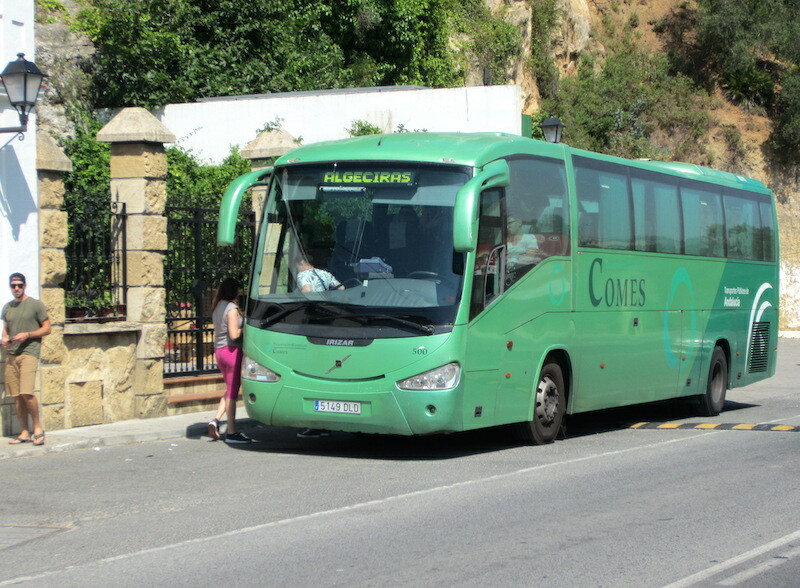 The bus to Algeciras. This really is a boring photograph but I include it for the bus spotters who read this blog. Believe it or not there are people who engage in bus spotting. It’s an activity similar to train and plane spotting. When Bev and I were running tours into the outback I often asked retired passengers what there interests were in retirement and one passenger answered, ‘I bus spot’. The man in question sat outside one of the large bus depots in Sydney and recorded the registration numbers and makes of the buses that went in and out of the depot. Every man to his own, they say. The legs of ham. The paper cones are to catch any liquids dripping off the end of the hams into your beer! The legs of ham here may be not ordinary run-of-the mill hams, they are probably ‘Serrano ham’ meaning they come from the sierra (mountains). The majority of Serrano hams are made from the landrace breed of white pig, however some say the best quality ham comes from acorn-fed black pigs. Ham to the Spanish is like wine to the French, it’s a matter of preference. Personally, I don’t go looking for pig to eat and for a number of reasons including they are too close to us on the biological chain, they are unclean as they are the only animals I know of that eats its own excreta and commercially preserved hams and meats generally contain nitrates and nitrites which research indicates can cause cancer. Sodium nitrate is used for curing meats because it inhibits bacterial growth. It should be noted that I’m not suggesting the hams in the above photograph contain nitrates and nitrites, they may have been cured using a more health-friendly method such as the use of salt and pepper. Nitrates and nitrites do occur naturally in vegetables but vegetables contain vitamin C which acts as an antioxidant. The nutritionists say if you must eat meats preserved with nitrates and nitrites only eat it at Christmas (once a year) or if you eat it more frequently take vitamin C at the same time. Nitrates are used in most preserved meats including hot dogs, salami, frankfurts and the like. Research carried out in the USA shows that children who eat excessive numbers of hot dogs have a higher incidence of leukaemia. 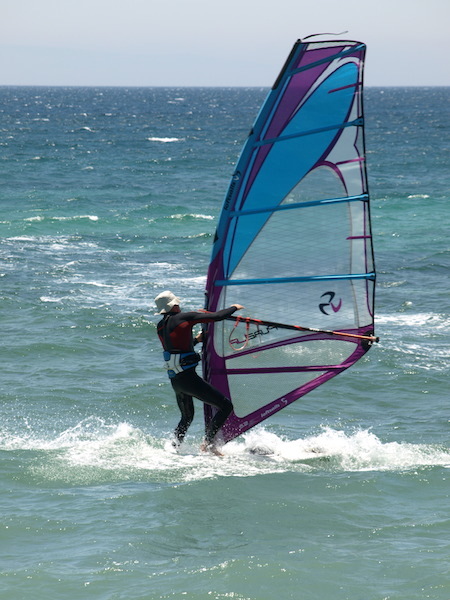 Bev and I were last in Tarifa 42 years ago. Below is a page from my 1973 diary. 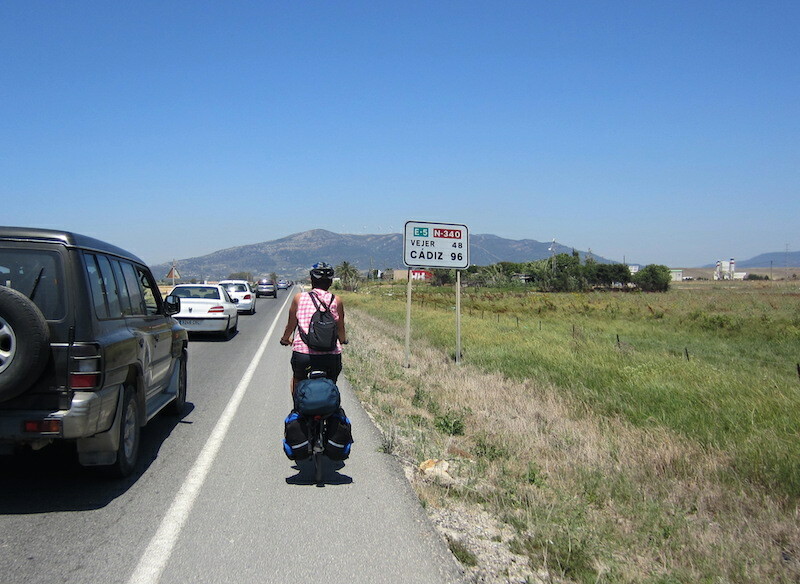 Once off the bus in Tarifa we put our bikes into touring mode and took the Cadiz road and headed for Camping Torre le la Pena about nine kilometres to the west. The writing under the sketch indicates sun, wind, sun, wonderful sun for nine days. Total cost for six nights camping $9-80! 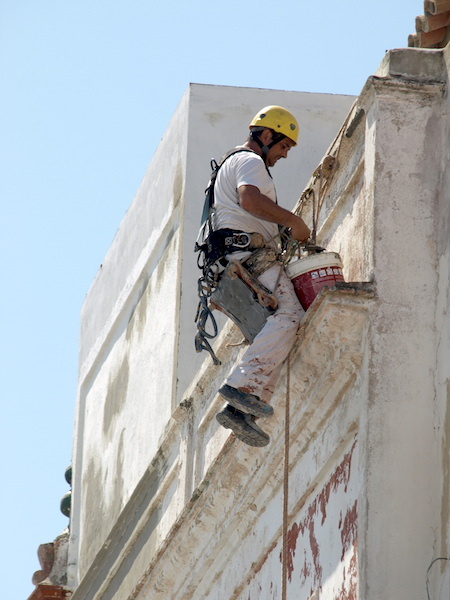 The drawing (Sat 14th) relates to an altercation we had with a cement truck in Tarifa. I was driving, minding my own business, when a readymix cement truck pulled out and hit the Beetle’s rear mudguard. The police came to the scene and not being able to communicate all they did was feel our arms and legs. When nothing was broken we all went our separate ways. 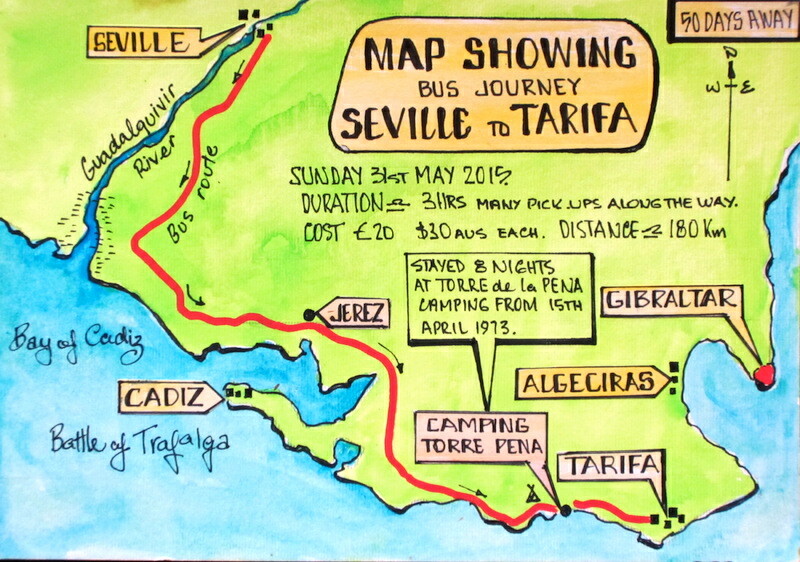 Prior to arriving at Tarifa 42 years ago Bev and I had driven from Munich in Germany through Austria, Hungary, Yugoslavia, Greece, Turkey and Lebanon to Syria. We were hoping to get to Iraq but trouble on the border prevented us. From Lebanon we intended to drive across the top of North Africa but again border trouble on the Egyptian/Libyan border prevented us from doing so. 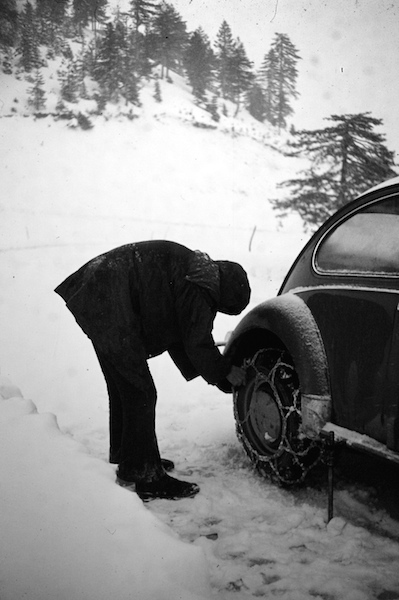 From Damascus, our turning point, we drove to Spain in the hope we would find warmer weather as our travels to that time had been in midwinter. 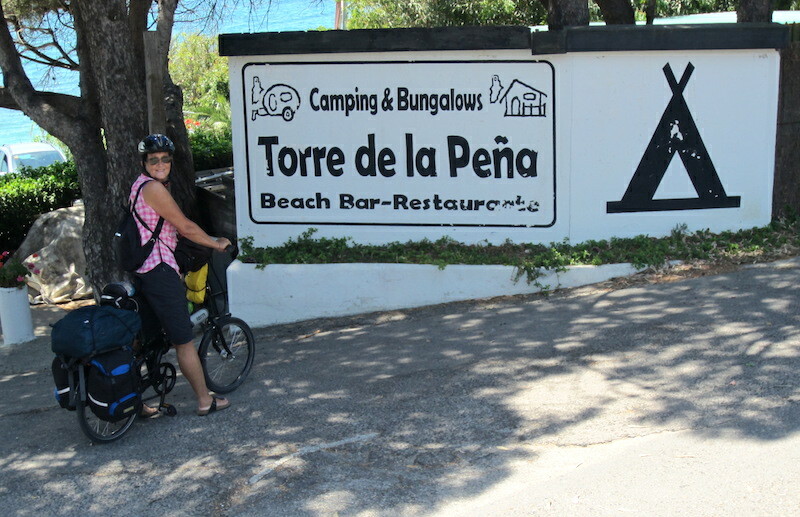 We decided to go as far south in Europe as we could and ended up at Camping Torre le la Pena. 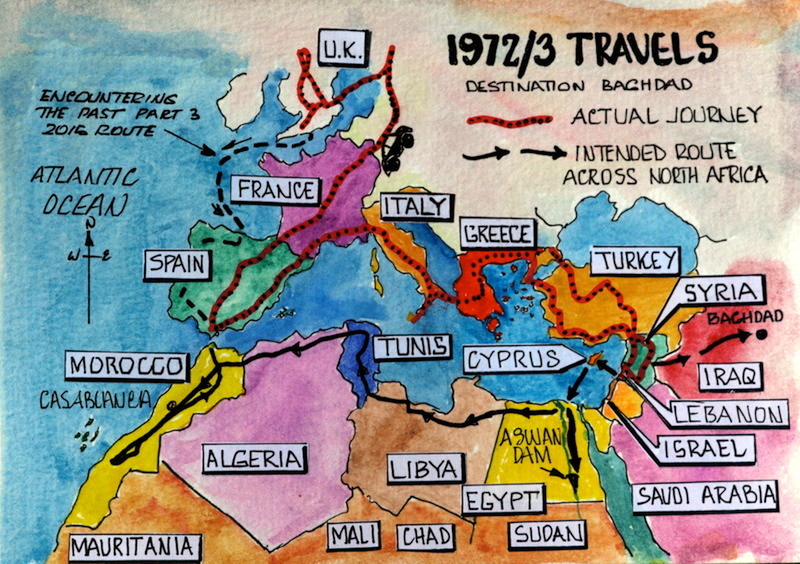 The following map shows our 1972/3 journey (redline black dots) and our intended journey (dotted black line) across the top of North Africa to Morocco, which didn’t eventuate. On the road between Syria and Spain. It’s not hard to understand why we were looking for the sun. 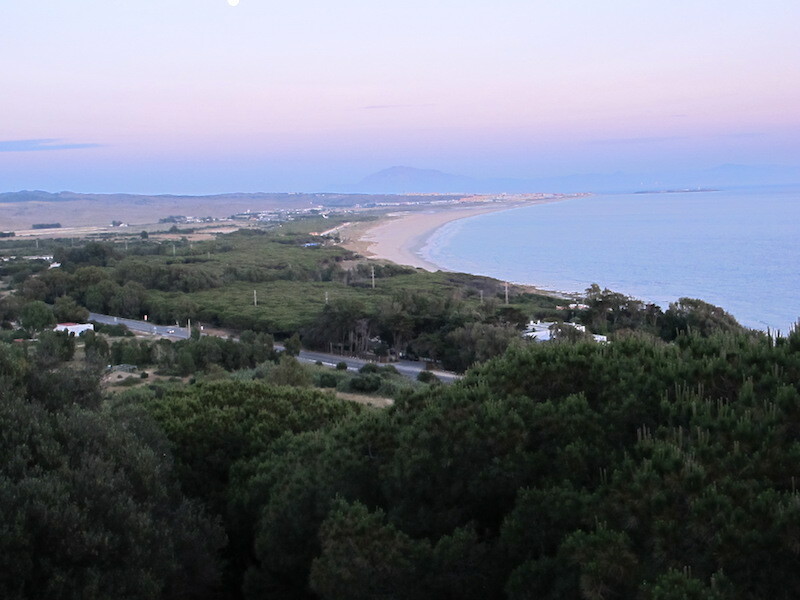 The road from Tarifa to Cadiz and Camping Torre de la Pena. Strait of Gibraltar on the left. 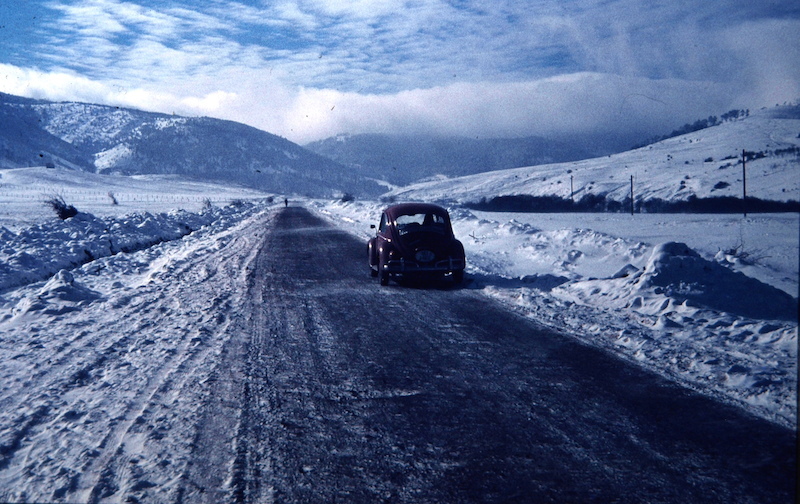 The old road (left of barrier) along which we travelled 42 years ago. The Rio Jara en route to Camping Torre de la Pena. Bad luck about the overhead telephone line, I couldn’t position myself to avoid it. Not in our wildest dreams would we have thought we would be back four decades later. 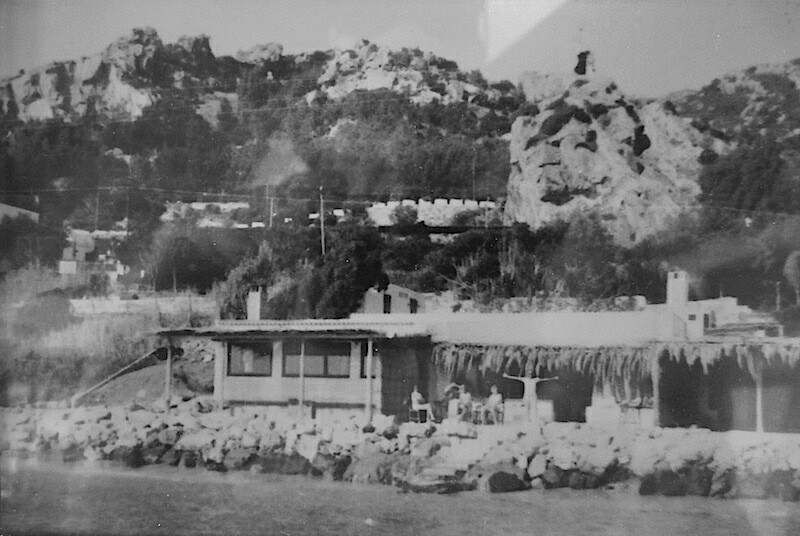 The beach bar in the 1970s. 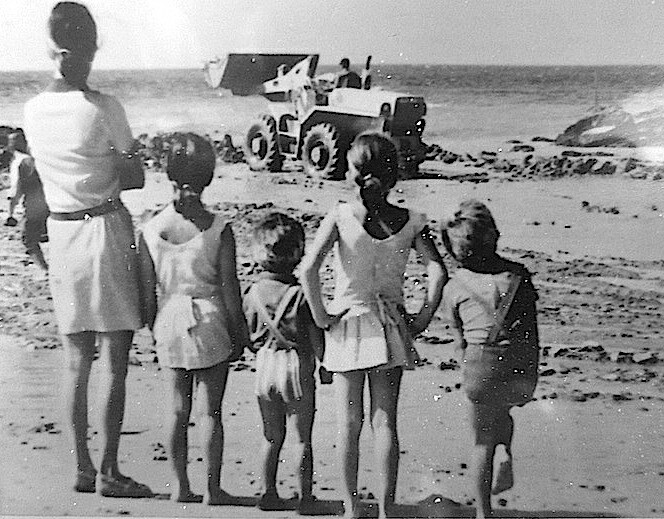 The present owners of Camping Torre de la Pena are the children in the above photograph. The ‘little kids’, Juan and Anna, are still at Camping Torre de la Pena, the only difference is they have grown up a bit. The reception office today. From what I remember in the 1970s it wasn’t quite as flash. 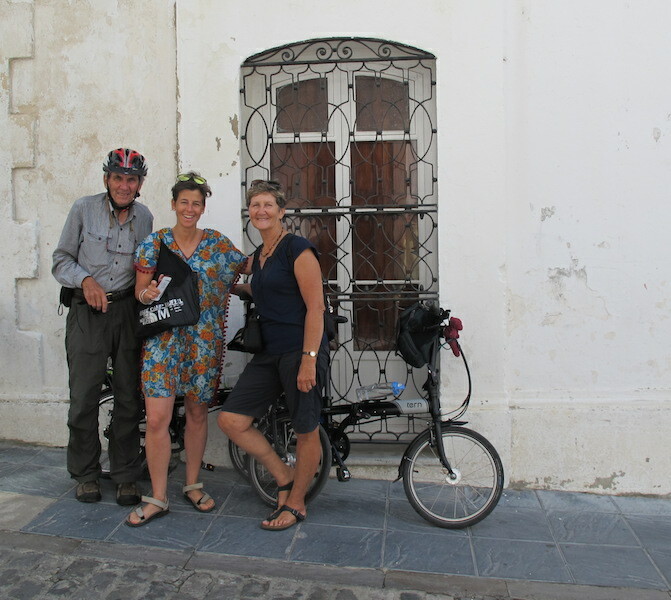 When we arrived at the reception office the present owners were fascinated by our stories of travel. We booked into a cabin and because Juan and Anna have a policy of giving return campers a 10% discount they accorded the discount to us. 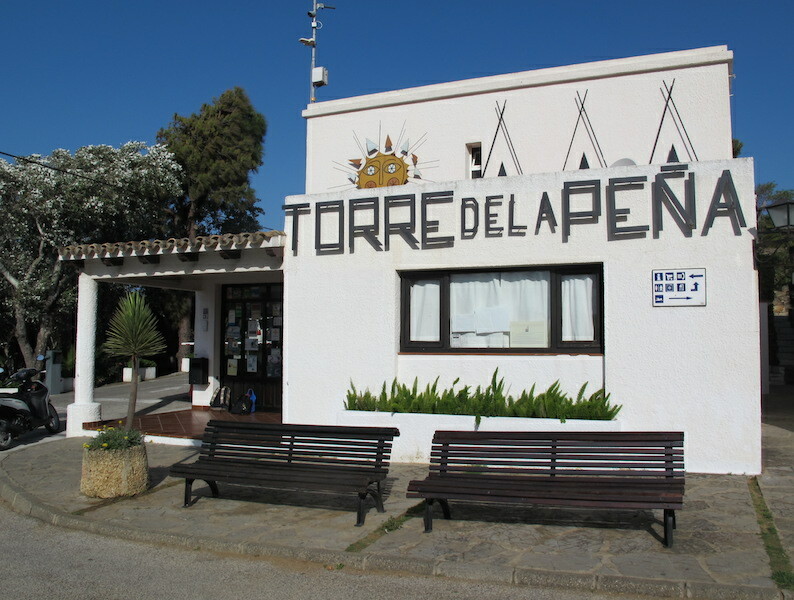 Of course there have been a lot of changes at Camping Torre de la Pena, and not cosmetic ones. There are new camping zones and many new buildings. Bev and I went hunting for the spot where we camped so long ago and we think we found it. The area where we camped in 1973. 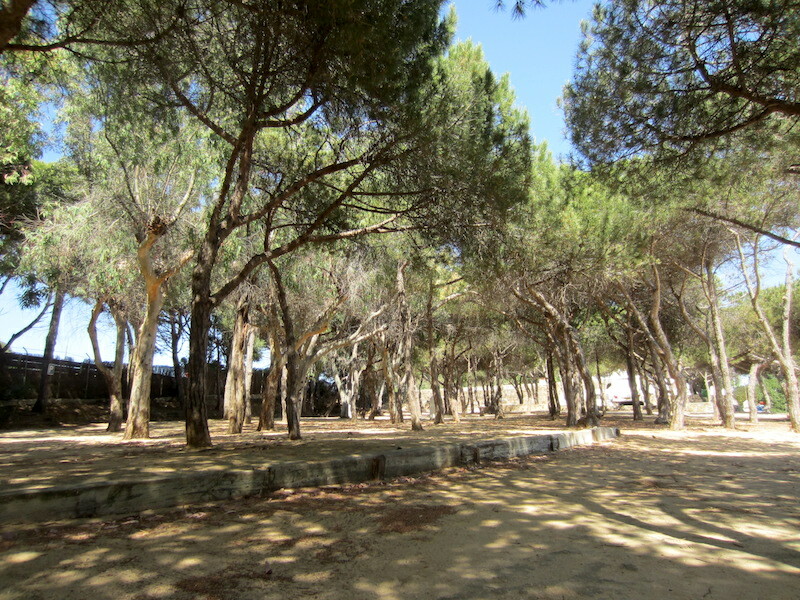 The foreshore of Camping Torre de la Pena has not changed a great deal except to say there is less beach now. Apparently a few years ago fierce storms raged and a portion of the beach disappeared. However there is still plenty of sand for the beach lovers. Sweeping beaches. Camping Torre de la Pena campground is in the trees on the right and the mountain on the far horizon is in Africa. 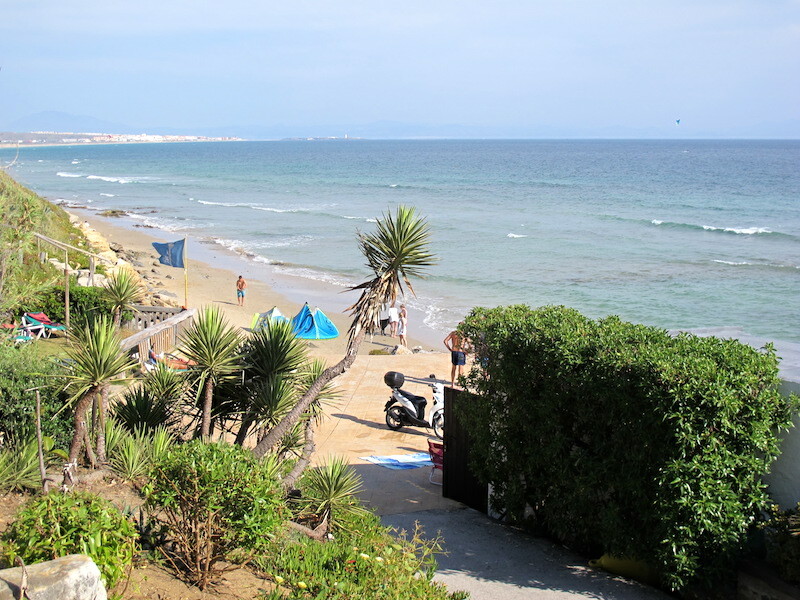 Beachfront with Tarifa town on the left in the distance. Old fortification. 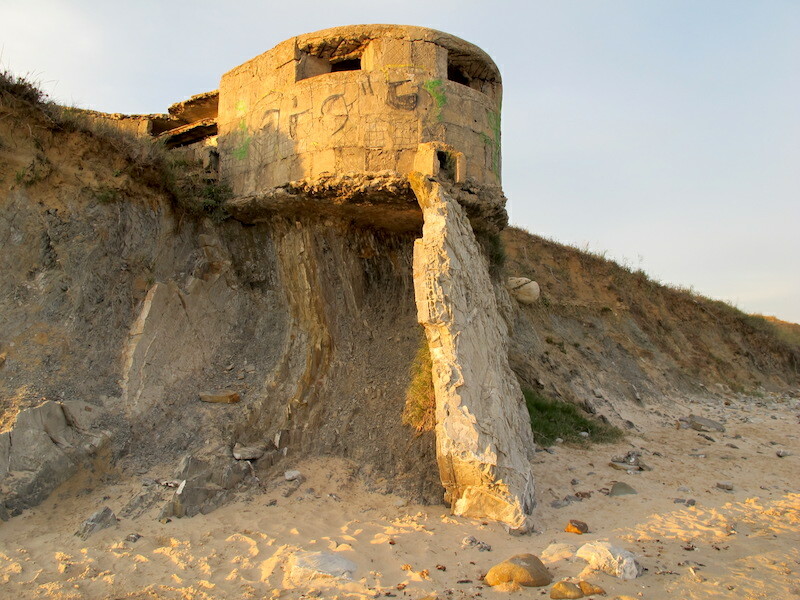 Its site was obviously selected because of the natural foundation. The extent of the foreshore erosion is evident. Looking west along the foreshores of the camping area. Uplifted limestone along the foreshore. 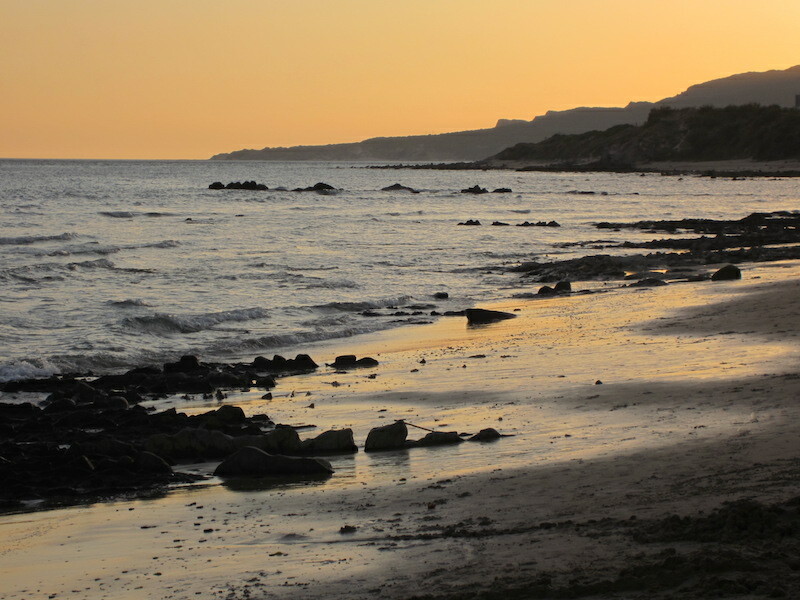 The geology of the Strait of Gibraltar, and that includes of course the geology of the Camping Torre de la Pena area, is complex and even though many geologists have spent a lot of time researching the area all is not yet known. 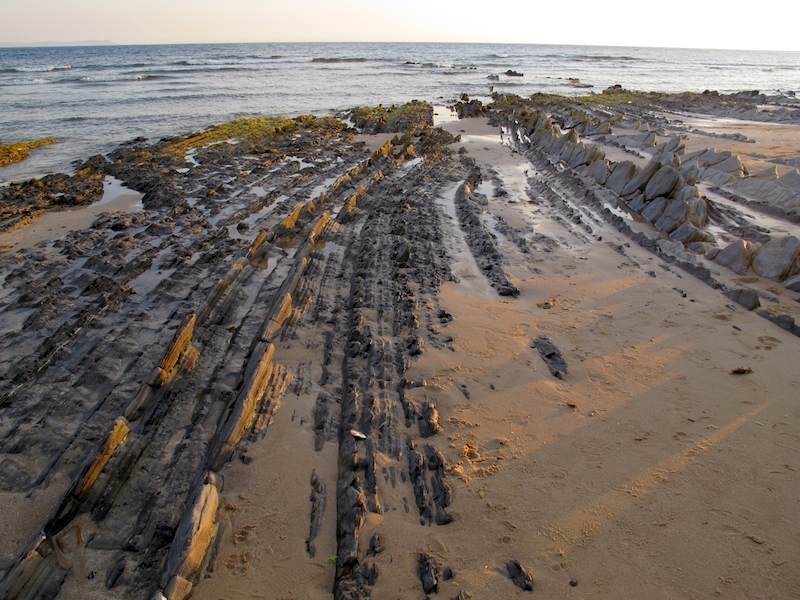 What is known is the region was created in the Jurassic Period when shells of marine organisms accumulated in the region, laying down a layer of limestone. Subsequent compression and uplifting combined with a lower sea level closed the strait and what we now call the Mediterranean Sea was a massive landlocked lake. The waters in the lake evaporated around 4.5 million years ago. 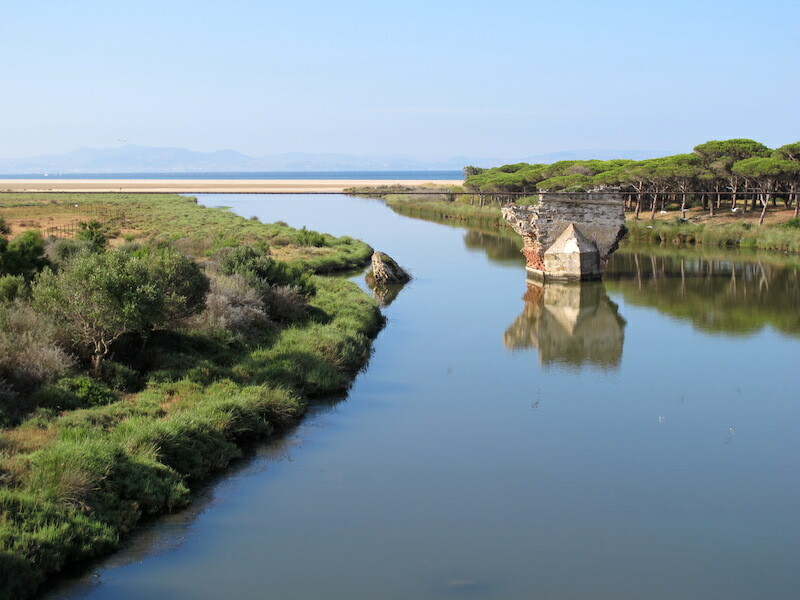 There was a serious crust movement and waters from the Atlantic rushed through the strait refilling the dry lake forming the Mediterranean Sea. In the above photograph the almost vertical layers were once lying horizontal and if one lets the imagination wander a little it is easy to understand the geological processes of compression and uplifting taking place. NASA image of the Strait of Gibraltar looking from west to east into the Mediterranean Sea. Image credit: NASA compilation and in the public domain. 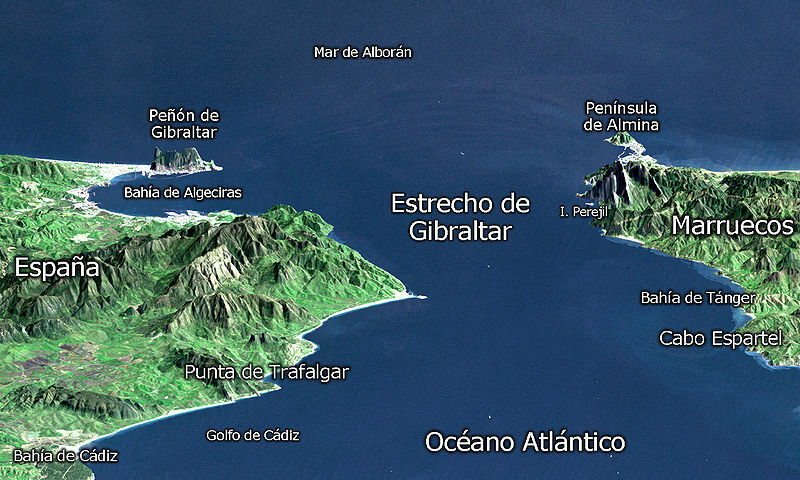 The most southern point on the left (northern landmass Espana) is Tarifa town (straight under the G in the word Gibraltar). The landmass on the right (southern) labelled Marruecos is Morocco. La Pena Tower within the camping grounds. 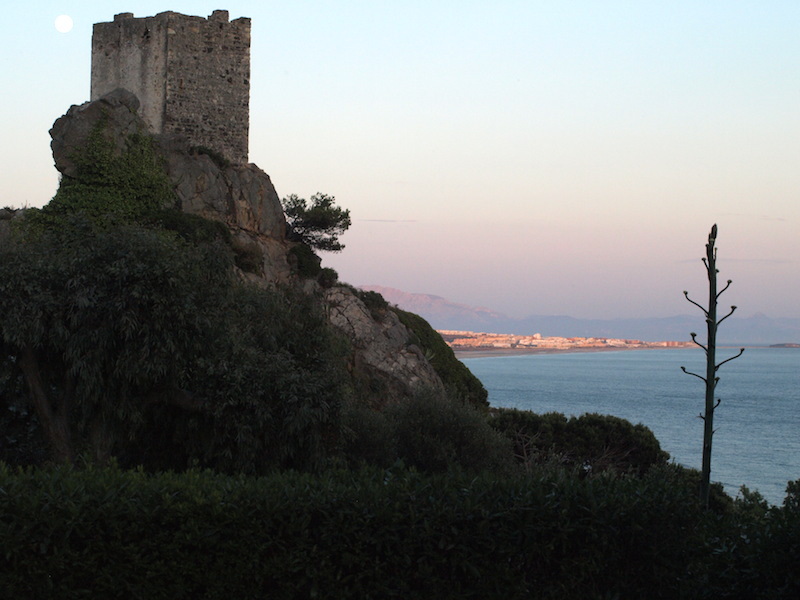 The mass of buildings on the horizon bathed in sunset light is the town of Tarifa. 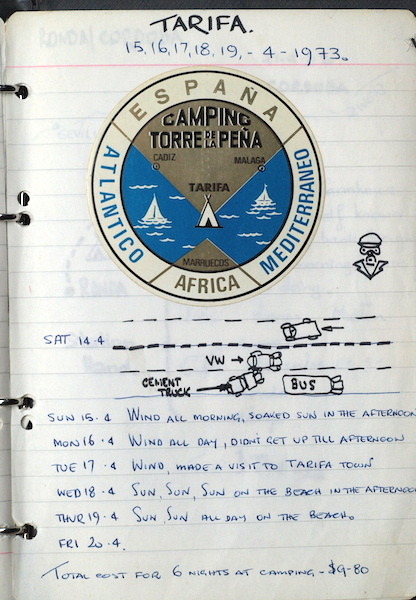 The three days at Camping Torre de la Pena this time were as enjoyable as they were in 1973 and naturally whilst there we reminisced, enjoyed the beach and its surrounds once more. We probably spent more on food this time as our budget in 1973 was very much restricted. 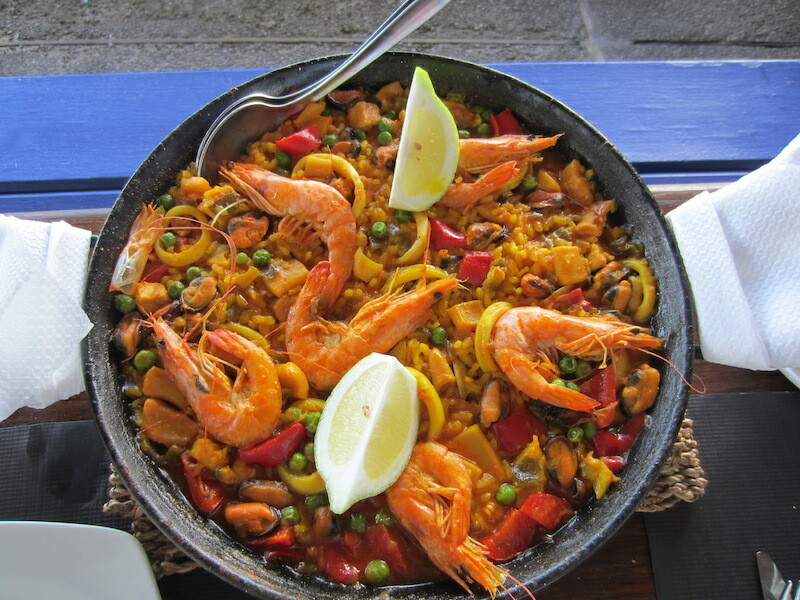 Paella, the national dish of Spain, served at the camping area restaurant. There are a number of advantages in writing a travel blog which include learning much about the region we are travelling in, having a lifelong record of our travels, friends and family knowing where we are and what we have been doing, making contact with like-minded travellers, keeping many armchair travellers entertained and because the research, writing and map drawing takes time it slows us down. 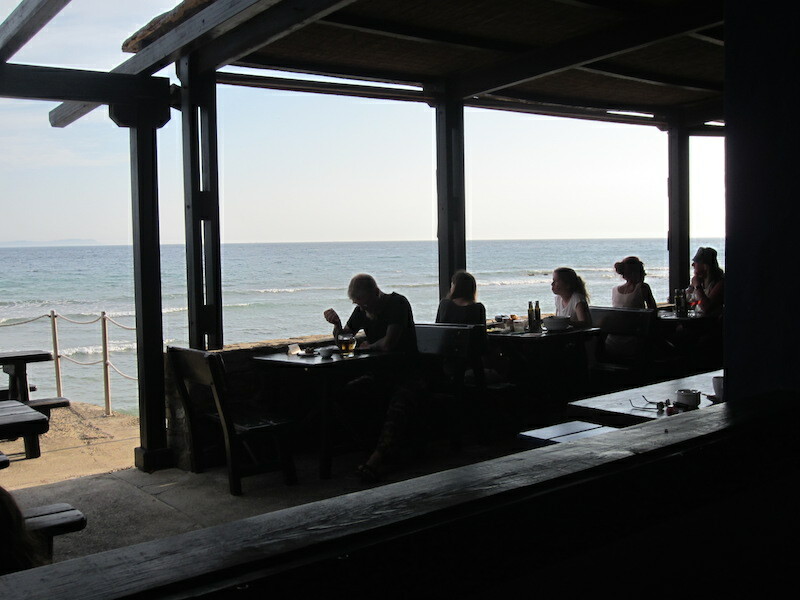 I would say that on average we stay an additional two days in some locations to enable us to catch up on the blog. Naturally, if we do decide to stay put and catch up we choose a pleasant location and somewhere where there is a good internet connection. Camping Torre de la Pena has those qualities so we decided to stay a few days. The following photograph shows my drawing equipment with lunch. 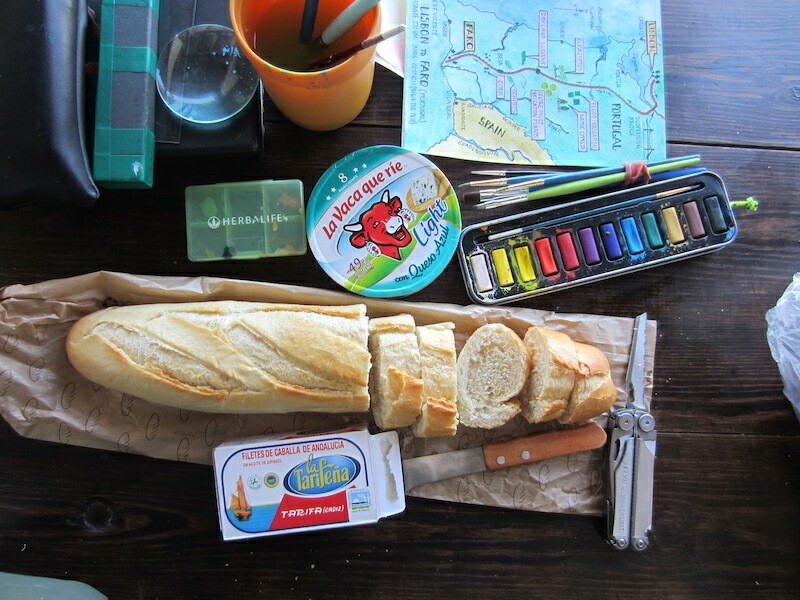 My art gear mixed with a simple lunch of bread, cheese and Tarifa canned sardines. From our lunch spot we looked across the strait towards Morocco. 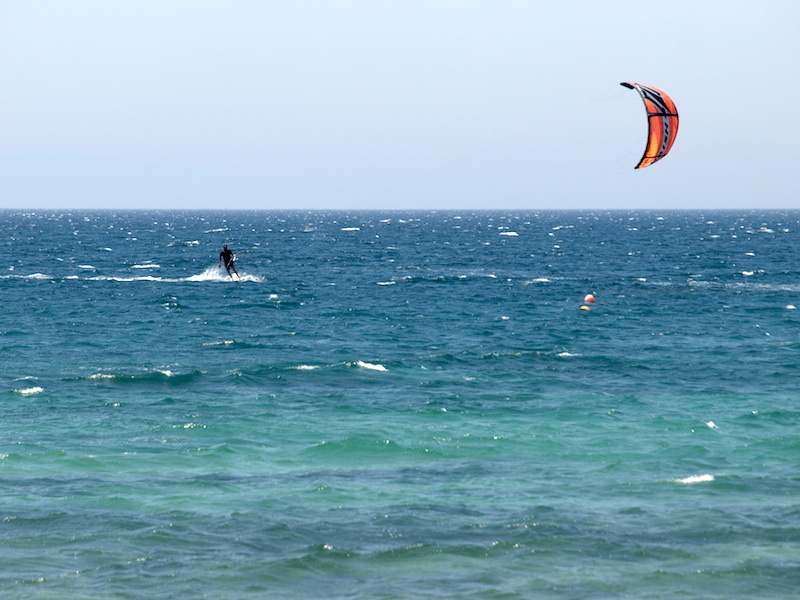 Kite surfers flock to the area because the wind blows constantly. A gentle east wind can become a gale due to wind compressed through the narrow land mass. The wind that blows from the east is known as the Levant or a mountain gap wind. Levant was mentioned when talking about stork migration from Africa to Europe recently in the posting Spain: Salamanca). Gap winds can produce dangerous seas especially when they blow against the tide or swell through the strait. Wind, wind and more wind. Looking across the Strait of Gibraltar towards Morocco. 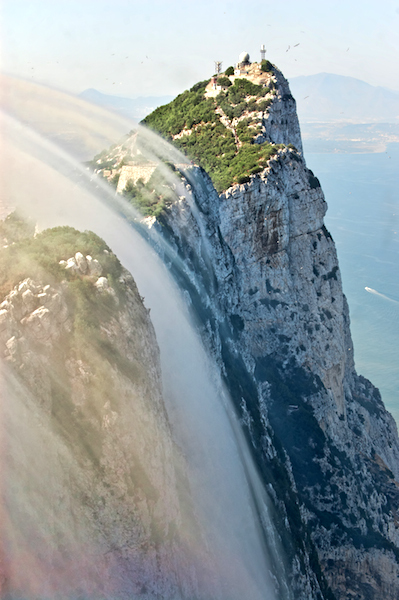 Levant clouds forming against the eastern side of the Rock of Gibraltar. 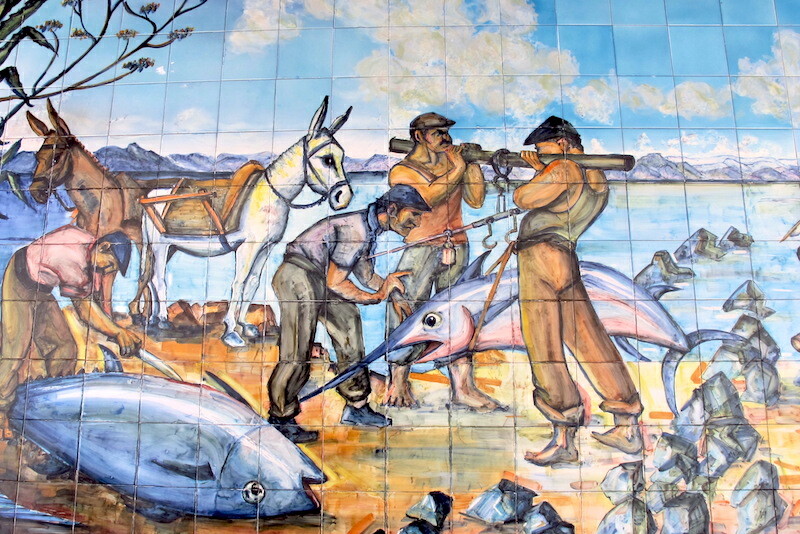 Image credit Mac Dor via Wikipedia. 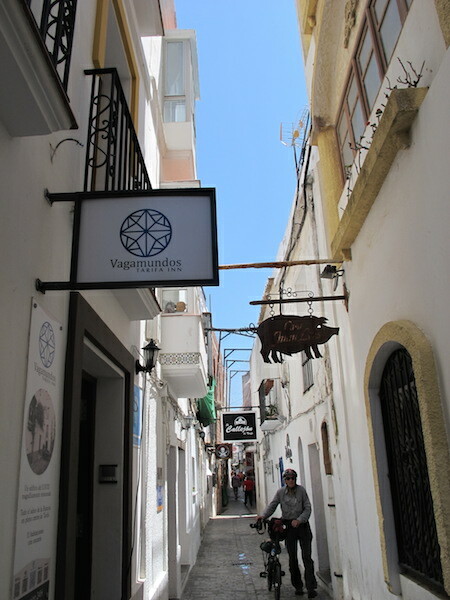 During our stay at Tarifa we not only caught up with the blog but made a couple of forays into the old town and like many old coastal towns it was the narrow alleyways and back streets that attracted us. Whilst taking breakfast in an open air café an Italian lass (Julia) eyed our bikes and came to us wanting to know where we were from and where we were going. 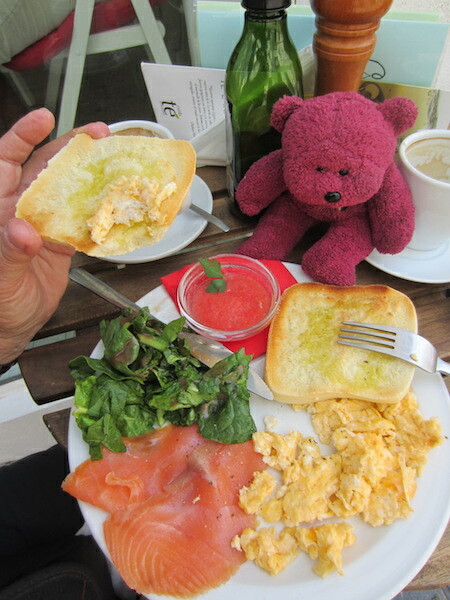 BBear about to indulge in breakfast – scrambled eggs, salmon and salad. In the small glass bowl is tomato puree used as a spread on toast. Julia invited us to visit her should we visit Italy, she lives near Lake Como. Of course we invited her to stay with us if she ever comes to Australia. One of the many narrow alleyways in Tarifa old town. 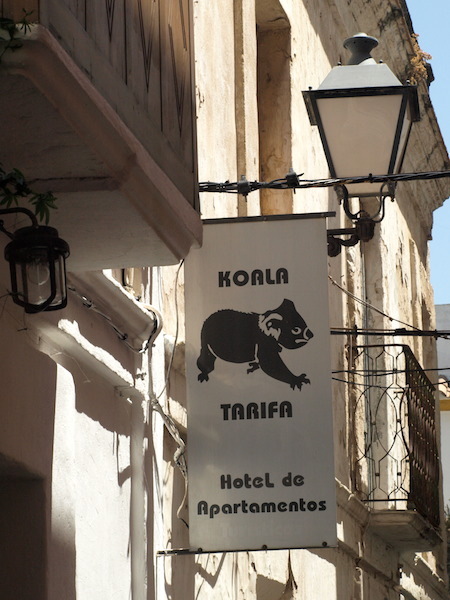 The backstreets of Tarifa were once the lairs of pirates and contraband sellers. These days the streets are lined with commercial outlets and because it is close to Morocco it’s understandable that there is the odd shop selling Moroccan leather goods. One leather shop owner spoke particularly good English and even though he would have liked to have sold us something he understood that bike riders do not buy as they simply cannot carry anything other than the bare necessities. 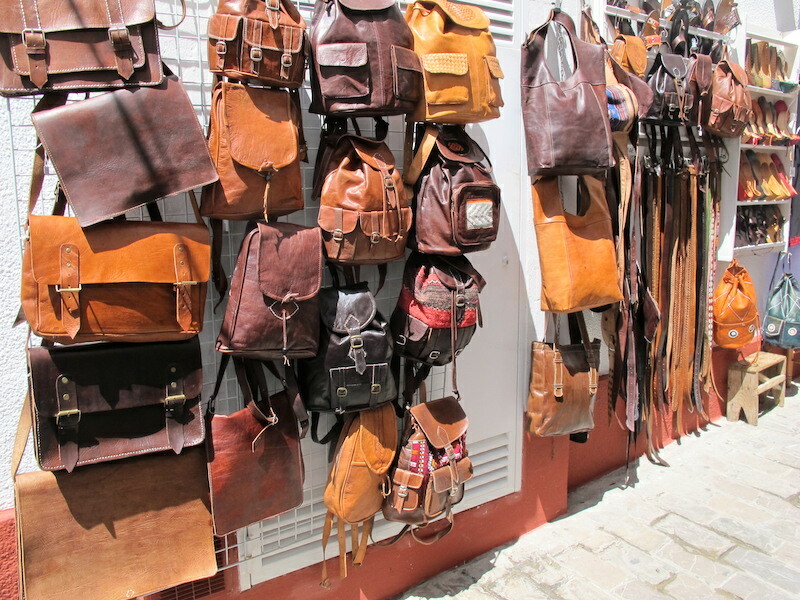 Some of the beautiful leather goods for sale. Bev getting the ‘drum’ as to where to go in Tangiers Morocco. The friendly owner is a native of Morocco. 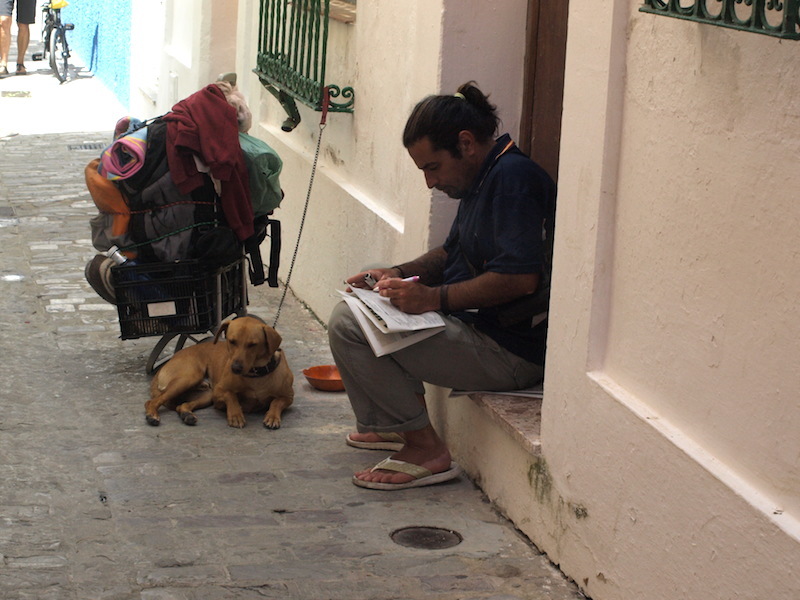 Doing the crossword in the backstreets of Tarifa. This gentleman has the hallmarks of being homeless but he might just be a traveller who has accumulated too much stuff. The traveller in the previous image was sitting on a step next to the Koala Inn. 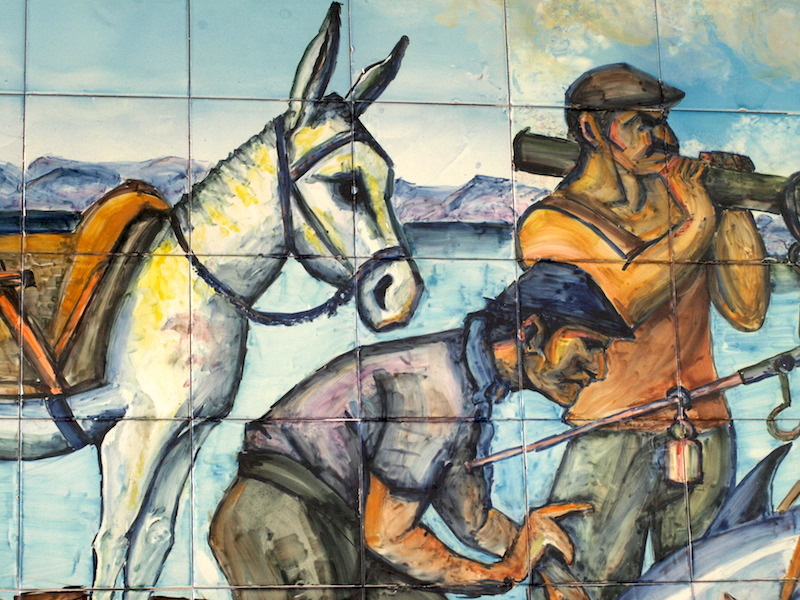 Tile mural in the backstreets. Tuna and swordfish ready for the chop. There are very few donkeys in Spain these days, they have been replaced by much more sophisticated means of transport, mostly small commercial vans. 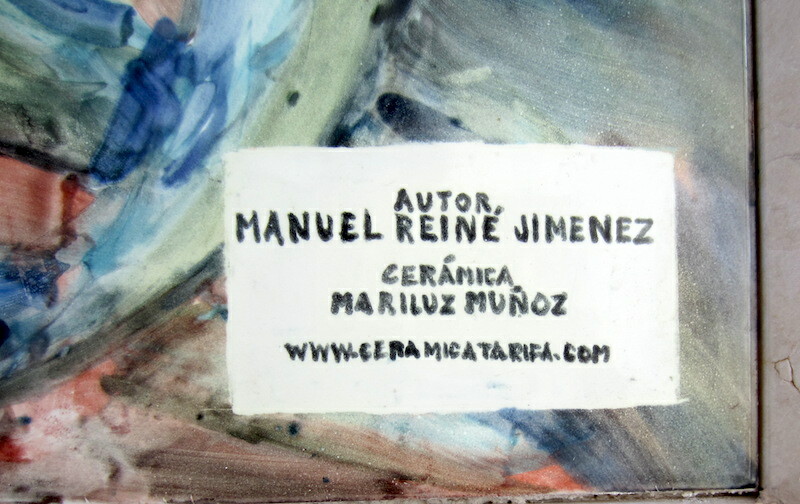 The tile mural was the work of Manuel Reine Jimenez. 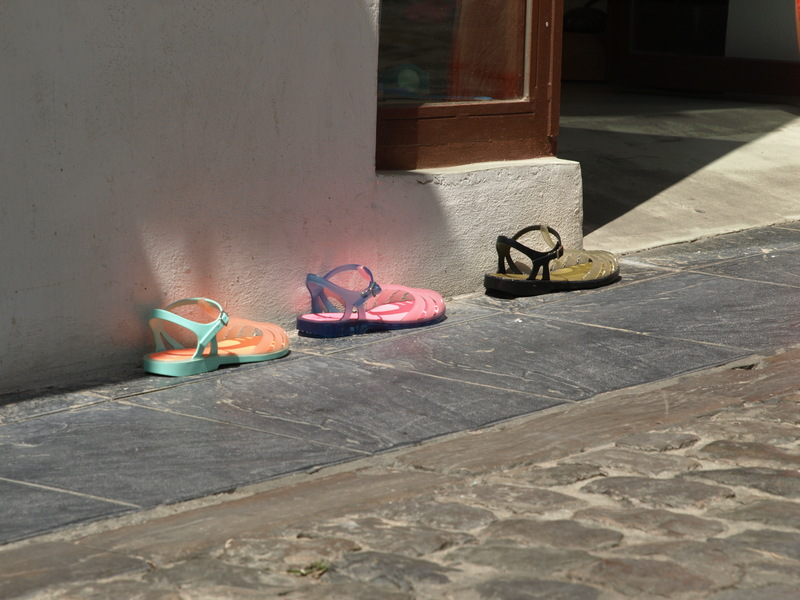 Before closing this post I would like to share with you a few photographs taken in the back streets of Tarifa. The subject matter does not relate to anything specific. I took them because I found the subjects interesting. Enjoying the sun and waiting for a customer. Four floors up, hard on the knees. Shoe shop advertising. The street was too narrow for sandwich board advertising outside the shop so shoes on the street leading to the shop door was an alternative. Neat! That’s the end of another post. The next will take us on a journey to Tangiers from where we will explore Morocco. Tag along for a journey to a country that has changed little since the 1970s. We are both looking forward to the experience. When I think Morocco, I think Humphrey Bogart and Ingrid Bergman and the quote, ‘Here’s looking at you kid’. 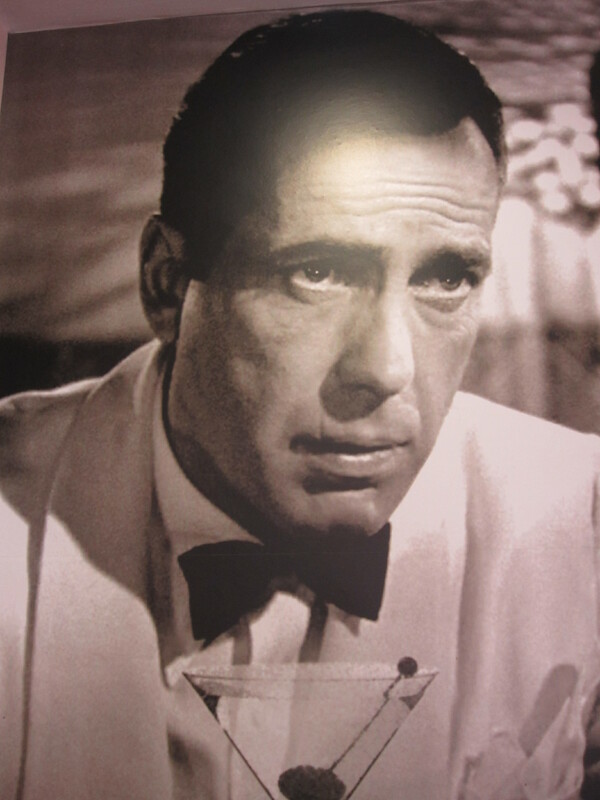 Bogart in the mid WW2 movie Casablanca. This image of Bogart is in the public domain as it was never copyrighted. Leave a comment if you wish and if you haven’t already clicked on follow, do so and you will be alerted each time we do a posting. Heard it might be your last trip to Europe for a while. Maybe it’s time to tackle India ? There are some great value Amtrak Rail U S A passes you could also sleep on the train occasionally . definitely fascinating report! hope you’re enjoying your further trip through France.